COMEDK has been assigned the task of organizing a common entrance test for the current academic year. COMEDK entrance test & publication of test score and rank list will be followed by centralized counseling (Single window system). Students must have passed 10+2 higher secondary or equivalent examination, recognized by State / Central Government with minimum 50% of marks taken together in PCB (40% in the case of SC, ST and OBC candidates of Karnataka State). The last two years of study shall comprise of Physics, Chemistry and Biology (PCB) with English as a compulsory subject. Students shall complete the age of 17 years on or before 31st December of the year of admission to the MBBS/BDS course. 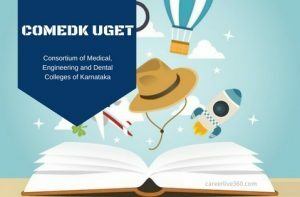 COMEDK Medicine UGET-2017 will have questions on Physics, Chemistry, Biology and English. Candidates appearing for both Medical and engineering courses will have to appear for Mathematics paper also. The computer-based examination will consist of multiple-choice questions. Each question will carry one mark and there will not be any negative marking. You need to mark your answers on the OMR Answer Sheet. You must use either black or blue ballpoint pen in the exam. Use of pencils/erasers/whiteners etc is not permitted in the exam. The counseling schedule for college allocation to qualified students will be announced by COMEDK after the announcement of results. Students will be required to be present for the centralized counseling as per the schedule announced on the official web portal of COMEDK. Candidates appearing for COMEDK Medicine will have to answer questions on Physics, Chemistry, Biology and English subjects. ourses. Admission in B.Arch courses will be done through NATA score. The examination authority announces eligibility criteria that ensure the eligibility of the aspirants. The examination will be conducted on 13th May 2018. 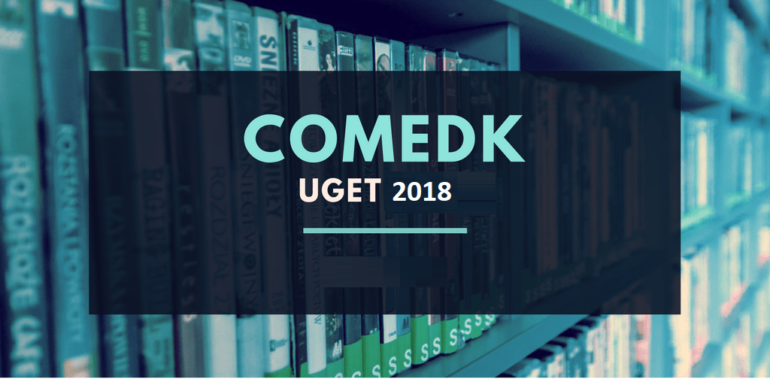 In this article, we are providing the officially declared COMEDK UGET 2018 Eligibility Criteria. Qualifying Exam:The aspirants must have passed 2nd PUC or 10+2 higher secondary or its equivalent examination from the recognized board. Subjects:Aspirants should complete the last two years of study with PCM and English as a compulsory subject. Minimum Marks: Aspirants should qualify the above examination with a minimum aggregate of 45% marks (40% marks for SC/ST and OBC category of Karnataka) in PCM subjects. Pass these subjects individually. Aspirants please note down that you must have Physics and Mathematics as a compulsory subject along with any optional subject as Chemistry or Bio Technology or Biology or any other technical vocational courses. Diploma Holders:COMEDK UGET 2018 will not be conducted for the diploma aspirants because there are no lateral entry admissions. Aspirants have to produce original marks card of the qualifying examination during the counselling process. Qualifying Exam:Those who are interested for the architecture courses must have complete 2nd PUC or 10+2 higher secondary or its equivalent examination which is recognized by the State/Central Government. Subjects:Pass above examination with Mathematics as one of the mandatory subject. Diploma Holder: Aspirants having 10+3 diploma recognized by the central/state government can also apply. Minimum Marks:The percentage criterion of 50% marks (45% in case of SC/ST) is required in the qualifying examination. NATA Score Card:Must have appeared in National Aptitude Test in Architecture (NATA) conducted by Council of Architecture and secure minimum 80 marks out of 200 (for all category aspirants). No entrance test will be organized for admission to B.Arch Courses. For Medical must have cleared 2nd PUC or 10+2 or any equivalent exam recognized by state/ Central government. The two yers of this study must consist of Physics, Chemistry and Biology with English. The candidate who are in General merit must have passed the subjects Physics, Chemistry and Biology with a minimum of 50% score. Also, the general merit candidate must have scored at least 50% of marks in English (40% for SC/ST/OBC) in the entrance test. The candidate must be minimum 17 years of age before taking admission into MBBS/BDS/ courses. The candidate must have passed 10+2 or any equivalent exam recognized by state/ Central government. The syllabus of study must consistPhysics, Chemistry and Mathematics with English. The candidate who belong to the general merit list must have passed the entrance exam with minimum 45% score in the subjects of Physics, Chemistry and Mathematics. The candidate who are having a diploma in engineering are not eligible to take admission as the COMEDK UGET Eligibility criteria do not allow lateral entry into any courses. The candidate must have passed Xll or any equivalent exam recognized by state/ central government with the minimum of 50% of aggregate marks. Physics, Chemistry and Mathematics as the main subjects are mandatory. The candidate must have appeared for national aptitude test for Architecture (NATA) and must have scored at least 80 out of 200 marks. There will be no entrance test for the candidate aspiring for admission into B.Arch. 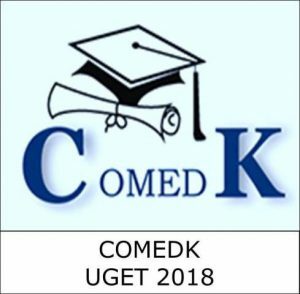 Courses according to the COMEDK UGET Eligibility criteria 2018. Applicants must check for the eligibility criteria for the exam before beginning the UGET 2018 registration process.